Many people with gut problems such as IBS, SIBO, IBD, and the like take to low fiber diets to manage their symptoms. While this isn’t necessarily a bad approach in the short-term, current best practices indicate that this approach may not be suitable in the long term(>2 months). There are a number of reasons for this being the case. First, they limit a lot of otherwise healthy foods and can lead to nutrient deficiencies. I wouldn’t consider this a low fermentation diet specific issue since most people eat a horrendous diet anyway. The primary issues with using these diets long term comes down to a lack of fermentable carbohydrate, which is how they generally tend to reduce symptoms. Fiber is known to be the munchie du jour of many of our resident microbes that protect against things such as Type 2 diabetes, obesity, and cardiovascular disease. By removing their food via a low fiber diet, this could increase your risk for these conditions. As a result of this, these diets not only tend to shift the microbiome, they also reduce some of the beneficial things our microbes make. As a byproduct of microbes munching on fiber, they produce short chain fatty acids that are the preferred fuel to the cells that line our gut, called enterocytes. This low energy state could throw enterocytes in to dysfunction including, but not limited to, leaky gut, increased inflammation, and impaired motility. Well, you can add another potentially negative effect to the chronic use of low fermentation diets: disrupted circadian rhythms. Circadian rhythms are daily fluctuations in organ and tissue function that follow an approximately 24 hour period. Every one of our organs and tissues has their own circadian rhythm which is meant to optimize physiology to the environment. The ultimate goal is to increase the chances of biological success. First to find food and survive, then to ultimately pass our genes on to the next generation. Our microbiome is often thought of as another organ, and given the abundant number of genes it contains, an incredibly important one. Despite the genes in the microbiome not being our own, our microbiome does follow a circadian rhythm. And much like the other peripheral clocks throughout the body, it’s set primarily by the feeding/fasting cycle. Of course, the master clock and other peripheral clocks do exert some level of control over the rhythm of the microbiome. Whether you jump on the Specific Carbohydrate diet(SCD), the Fast Tract diet, or the Low FODMAP diet, the intended goal is to decrease the amount of fermentation going on in the gut to reduce symptoms such as bloating and inflammation. While this gives symptomatic relief in the short-term, it can disrupt your circadian rhythm, as research in mice has recently pointed out. One of the core concepts in circadian rhythms is that all tissues and organs that observe them must utilize some means of communicating environmental factors between that tissue and others. We know that the master clock in the suprachiasmatic nucleus uses melatonin and cortisol to relay environmental information on light to the peripheral clocks in other tissues. The pancreas releases insulin, the gut bile, muscles different myokines, and fat tissue triglycerides and leptin. For the microbiome to participate, it too must utilize some form of communication molecule or molecules to synchronize with other tissues. The most likely candidates are the short-chain fatty acids(SCFAs) butyrate, propionate, and acetate, produced when bacteria in the microbiome ferment fiber. The very fiber most people limit in these low fermentation diets. In order to be a valid candidate to participate in circadian synchronization, SCFAs would themselves need to follow a circadian rhythm. A study published earlier this year investigated if this was the case. Both butyrate and acetate follow clear fluctuations from day to night, obviously dictated by feeding. Additionally, feeding both SCFAs to mice in the middle of the day, when they normally sleep, causes a shift in circadian rhythm. It’s not difficult to see how this could have an effect on human physiology. The circadian rhythm of butyrate and acetate caused peak concentrations in the cecum at the beginning of their active period, shortly after they woke up. Having higher SCFAs in the cecum would dramatically lower the pH there, making it more acidic. It would also provide enterocytes with adequate butyrate prior to acquiring food. In theory, this should make the colon less hospitable to foreign invaders. Another interesting finding of this study was that using antibiotics or A LOW FIBER DIET to wipe out the microbiome and eliminate the SCFA circadian rhythm negatively impacted the ability of clock genes in both the kidney and submandibular gland to entrain to the feeding/fasting cycle. In case you didn’t know, the submandibular gland produces saliva that contains salivary enzymes and antimicrobial peptides that set the stage for digestion and that kill pathogens that may be on your food. So this isn’t an insignificant problem. In addition to the gut, there’s a robust amount of evidence indicating SCFAs, both acetate and butyrate, have an effect on a large number of tissues. This includes the brain as well as the liver, muscles, and fat tissue. Part of this may come down to other tissues using butyrate and acetate as a fuel source, but both also have some pretty interesting epigenetic effects through their function in histone acetylation/deacetylation. Epigenetic regulation effectively pulls the strings for the circadian clock. In order to alter function on a daily cycle, genetic expression must change throughout the day. One form of epigenetic regulation, histone acetylation, adds an acetyl group to a histone which relaxes a structure called chromatin that normally prevents DNA from being read. Thus, histone acetylation increases genetic expression. During histone deacetylation, the acetyl group is removed from the histone, the chromatin condenses, and prevents the gene from being read and expressed. Histone acetylation/deacetylation is a core component of the circadian clock. Acetate can be converted to Acetyl CoA which is used in acetylation. Butyrate, on the other hand, is a histone deacetylation(HDAC) inhibitor. Since both follow a circadian rhythm and can alter epigenetic regulation of the circadian clock, abstaining from fiber may have a negative effect on your circadian rhythms due to epigenetic changes. The implications at just the level of the gut are pretty significant. 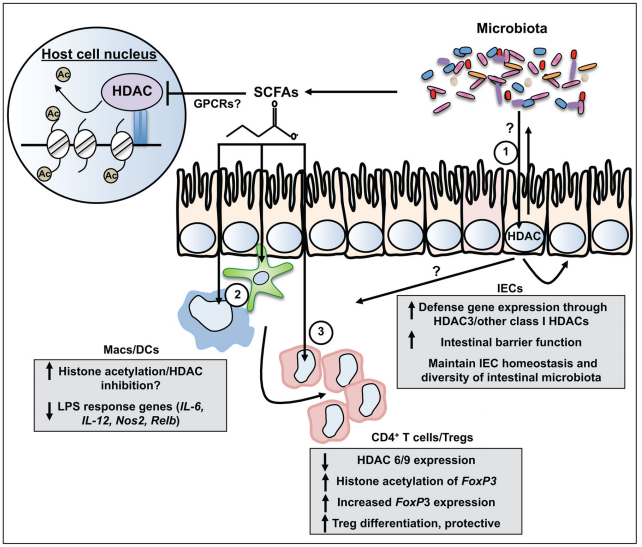 Exposing resident immune cells of the gut(Macs/DCs=Macrophages and Dendritic cells) to increased acetylation or HDAC inhibition via SCFAs reduces the inflammatory response to LPS, something you have in spades in your gut. Thus, the SCFAs butyrate and acetate may function as a brake on LPS induced inflammation in the gut via epigenetic mechanisms, but the effects extend past the gut. Many other tissues get access to SCFAs from the blood including the liver, kidney, brain, and possibly every other tissue you can think of. The wide range of tissues potentially impacted by a loss of the circadian rhythm in SCFA production indicates that long term use of a low fiber diet may not be a good idea. While I would still steer clear of using these diets long term, there are a few things that may potentially limit the damage for the short period that you do use them. First, it’s important to put this in to perspective. There is likely a high amount of individualization when you reintroduced, so you’ll have to find things that work for you. One man’s poison is another man’s day full of bloat, so it’s important to find fiber that works for you. Ideally, this comes from whole, unprocessed food that other beneficial nutrients such as lentils, brussels sprouts, and wild blueberries. If you’re coming from the SIBO world or have always eaten a low fiber diet, I would absolutely stay away from powders and stick to whole foods. Start slow, very slow, and work your way up. Second, based on the study above, time-restricted eating seems to be able to mitigate some of the negative effects, and fasting probably does as well if put at the proper time. This likely has to do with increased beta-hydroxbutyrate in the fasted state, which also functions as an HDAC inhibitor. Finally, and probably most importantly, realize that circadian rhythms are essentially a way for your body to solve the puzzle that is the environment. So best practices indicate that you should be dialed in everywhere else in terms of circadian entrainment. In other words, make sure your light exposure, physical activity, and other factors that set your circadian rhythms are in order during the 2 months you do one of these diets. 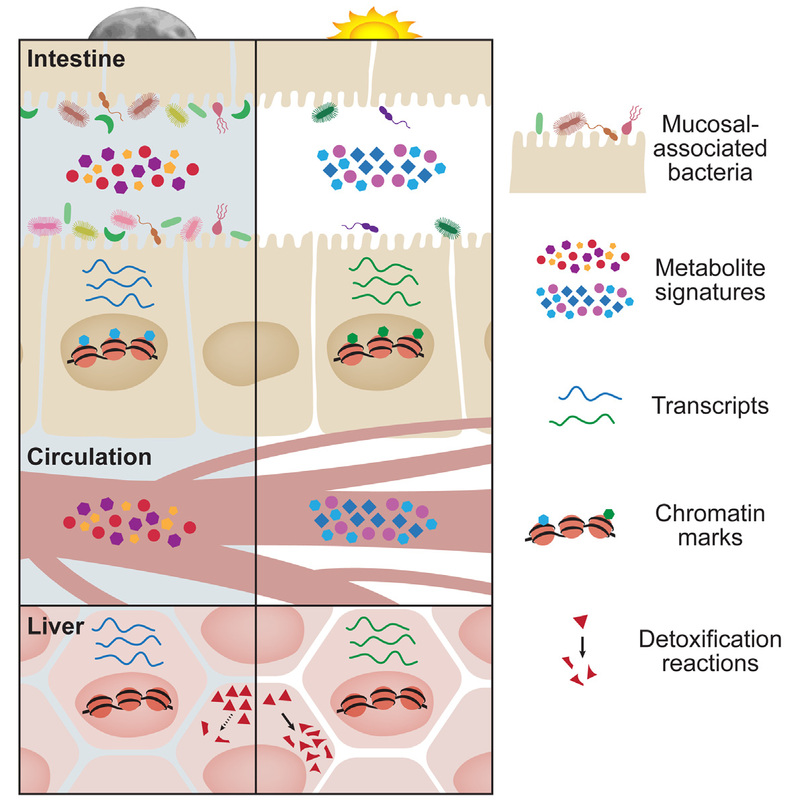 Evidence for this comes from a couple of studies that show the circadian disruption induced by jet lag alters the circadian rhythm of the microbiome and disruption of the microbiome causes circadian disruption in the liver. It works in 2 directions. So if you’re going to do a low fermentation diet for a couple of months, make sure you also make an effort to prevent circadian disruption. Many people take to low fermentation diets to reduce the symptoms of IBS, IBD, and SIBO. While these diets are likely ok for a short period of time, most experts in the area don’t recommend long term usage of these diet. Based on recent evidence, part of the disruptive effects of these diets over the long term may come down to circadian misalignment due to aberrant epigenetic regulation. If you decide these diets for the recommended 2-3 month period, it would be wise to take your circadian rhythms in to consideration. And just a heads up, it’s probably not going to be sufficient to just do TRE and block blue light. Based on the above study, a low fiber diet made it more difficult to entrain to TRE. Mice are nocturnal, rendering this study useless. Go caivore, get healthy and sleep! That’s neither well thought out nor evidence-based. That’s not to say that I think a carnivore diet isn’t better than what most people eat. It’s that there is a complete ansence of evidence for that and there’s no mechanism for it that can’t be reproduced via an evolutionarily correct process, aka fasting. Plus, tons of data that a high fiber omnivorous diet promotes both healthspan and life’s span. If you have that type of data I’d love to see it. Also, mice being nocturnal doesn’t disqualify all data based on them. All of the molecular mechanisms behind the circadian clock were discovered in lower organisms, and mice played a big role. Now shoo and go troll somewhere else.